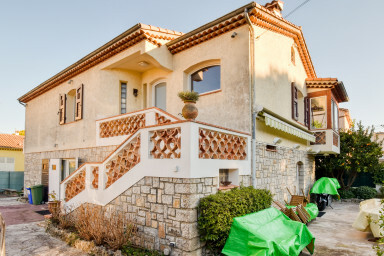 Nice and quiet 100m ² apartment on top of the house, located just next to Cannes center. Ideal for delegates (10 minutes by bus from the Palais des Festivals), as well as for tourists (10 minutes by bus from the beaches). This 3 bedrooms , can comfortably accommodate 7 people. The living room / dining room with a flat screen. You have a direct access on the west exposed terrace and equipped with a table and chairs. The first bed room has a double bed (180X200). There is a bathroom with bath and wc. There is an independent wc. A kitchen fully equipped with everything you need to prepare your favorite dishes : oven, microwave, fridge, coffee machine, kettle, toaster and dishwasher.